One rainy day, a guy know on the door with a package on his hand. I wasn't alarmed because I see that he is a post man. 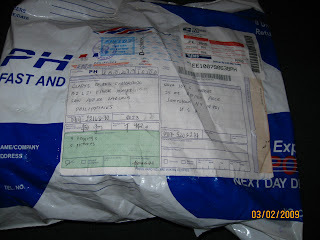 I didn't know that my sister's package from Philippines has arrived and I was overwhelmed to signed and hold the package in my hands. Was super exciting for her gifts to me, at the same time, some pictures they took from my brother's wedding last 14th of February. I think, I have mentioned that here . And since I am the only person who weren't around I was craving to see every single picture that captured during the moment. Anyhow, this package contains 3 pairs of leggings, an eye liner, 2 photos and a lovely note from my niece. I was touched and super happy. Tears fall from my eyes. wow, glad for you Nova, i too would get teary eyed from happiness when I get that priceless gift of being remembered from somewhere far. wow! galing naman. things like this never fail to perk us up, di ba sis? wow. i really love receiving packages. i am so happy for you. touching, huh? have a great day! enjoy your package! It's really hard to explain the feeling of receiving something from the family specially if you live with them miles away. Receiving a letter is great! How much more if it came with some stuffs and pictures? That was really awesome! My english is'nt very good, but I hope you understand. 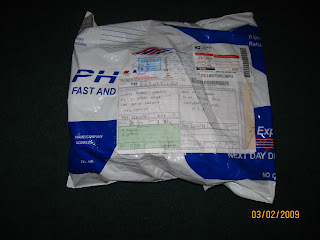 -Thanks for the visit dear, definitely an overwhelmed feeling when i got the package. I love receiving packages, hope you have fun with the things inside LOL. Looks like a bulky package to me! Wow! How nice naman ni sis and you are never forgotten. It is sad though that you were not present at the wedding. You wed with only around few month distance? Oh wow! well its good to receive anything exciting. Is it?